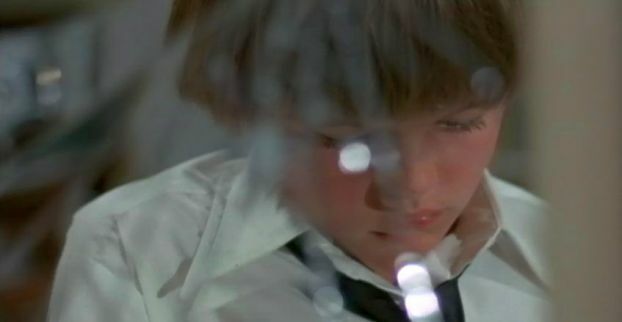 One of the few indelible images in director Robert Mulligan’s 1972 film of The Other is that of Niles in the freaks’ tent at the 4th of July fair, gazing at the Hydrocephalic Boy in a jar. This is what had become of the 2001 Starchild in just four years, a monstrous, clearly fake symbol of not limitless possibility awaiting realization but constrained grotesquery, stillborn. 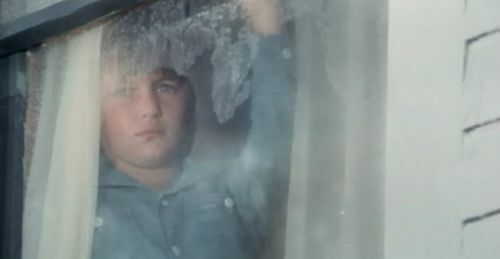 The image is counterpointed in the film’s last shot, situating Niles looking out the window as the family barn and apple cellar, symbol of former fruitfulness, are bulldozed. At the cusp of adulthood and the opportunity it offers, he remains unformed, never to emerge from his pupa like the Mexican jumping beans he gives Alexandra as a gift, to her dismay: she knows what he doesn’t realize he’s telling her. His dad dead eight months, his brother four, and traumatized Mother rarely leaving her room, who’s to teach him how to be a father and a man? A friend of mine once said nobody gets what they deserve. From my perspective, nobody deserves what they get. Maybe you won’t see a difference. Take this family, the Perrys, in this movie, The Other. Holland, all eleven years of him, covets, lies, and kills, and is still idolized by his twin, Niles. Niles tries to be good but causes unimaginable suffering to the ones he loves and ends up in an insane asylum; that is, the family home. Mother Alexandra, widowed by her own child, watches as things go south from there and ends up like Niles. Her mother Ada assumes responsibility for the way things degenerate and sacrifices herself trying to fix them, failing horribly. Victoria, who probably thought she got lucky when she was adopted into the Perrys while the family was prosperous, marries and has a beautiful baby but loses it in the most mortifying way. So tell me, which of us is right? The answer, of course, is that there’s no right or wrong in the world laid out by source-novelist and screenwriter Thomas Tryon; only things as they are. And that’s the hardest thing to live with. When he wrote his novel, Tryon was in a state of reinvention. Having given up on the acting career whose pinnacle was brutalization at the hands of Otto Preminger on the set of The Cardinal, followed only by roles in films of diminishing budget and prestige, he knew he had other personae to draw from. Yale-educated and trained to stretch his imagination in pursuit of truthful representation, yet closeted in a profession where men of his chiseled good looks were valued chiefly as romantic leads, he knew the significance of his title, a common term for the abject, shunned, and unfamiliar. What makes all this possible is the Great Game Niles plays with Old World Ada, who coaches him to project his mind into other beings, to think what they’re thinking and sense what they’re sensing. Both novel and film take pains to demonstrate the method Ada uses to get inside others’ consciousness (“Look hard … feel inside it … into its head … into its heart …”); the casting of acting coach Uta Hagen makes the grand metaphor Tryon is exercising clear: acting, outright; more broadly performance in all its meaning and scope, and the traumatic effects of same. Involving all manner of secrets and institutionalized denial, the buried anxieties racking Tryon’s characters crystallize around the revelation of how Niles has been using this gift, and the catastrophe it spells. It must have been a feat of hate-acting for Tryon to have appeared in I Married a Monster from Outer Space (1958), his first film lead after starring in Texas John Slaughter on TV. (It was released the year of Tryon’s divorce after three years of marriage; the actor himself never officially came out.) When his character is taken over on the eve of marriage by a spaceman unable to fulfill his mission to propagate his species with earth women, he and his cohort form a secretive society that convenes in the local bar, where they do less drinking and more spurning of hot-to-trot floozies’ advances. Since they can’t be told apart from normal people, the only way the locals can organize a posse to track them to their hideout is by engaging fathers; breeders. Tryon endured ten more years of such masquerades before giving up acting for the less coded confessional of writing. Though actors are frequently derided as narcissists, they spend their professional lives being other people, and that can wear on an ego. Hagen, in her book A Challenge for the Actor, posits this ability to empathize as the reason most actors are progressives; they know what it’s like to be in someone else’s shoes. Tryon had no doubt spent enough time acting the Other; playing author would be a process of gaining objectivity, by taking several roles at once. (A through-line in the novel involves a stain on the ceiling of the boy-now-man’s chamber, taking on definition as his story progresses.) Writing may be another Great Game, but it’s one where you control the narrative. There’s a tension between losing yourself, and finding yourself, in acting. 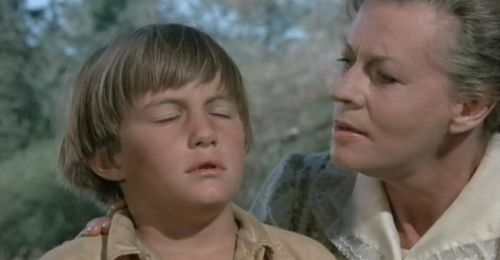 The Method, which Hagen taught, centered on the concept of affective memory: going into oneself to find the lived experience that would connect the actor to the role; conjuring the sense impressions of a moment and projecting them into the mindspace of the character. Sanford Meisner, Tryon’s coach, took a different tack, focusing more on getting out of oneself through a “concentrated use of the imagination.” His technique, akin to transactional analysis, directed its energies toward fellow actors to the point of parroting the other’s speech as a foundation for building a moment. Ada’s method involves a bit of both. When Niles projects his consciousness into others’, what he’s actually doing is going into himself, tapping into aspects, aspirations, and repressions not available in waking life. When he applies this technique on dead Holland (under Ada’s auspices, as a way of dealing with his brother’s loss), what begins as an attempt to transcend himself results in an integration of their separate personalities. Contrary to Meisner’s doctrine of liberation from the self (“Don’t give a performance,” he stresses in his book On Acting, “Let the performance give you”) is the sense of inhibition in Tryon’s narrative. 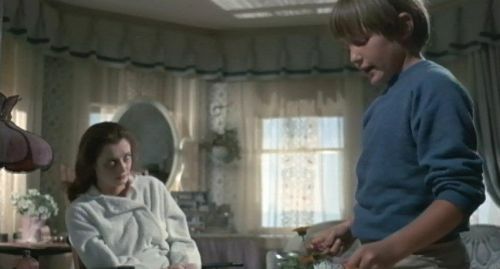 One of the few indelible images in director Robert Mulligan’s 1972 film is that of Niles in the freaks’ tent at the 4th of July fair, gazing at the Hydrocephalic Boy in a jar. This is what had become of the 2001 Starchild in just four years, a monstrous, clearly fake symbol of not limitless possibility awaiting realization but constrained grotesquery, stillborn. 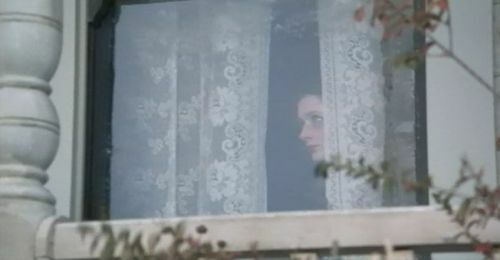 The image is counterpointed in the film’s last shot, situating Niles looking out the window as the family barn and apple cellar, symbol of former fruitfulness, are bulldozed. At the cusp of adulthood and the opportunity it offers, he remains unformed, never to emerge from his pupa like the Mexican jumping beans he gives Alexandra as a gift, to her dismay: she knows what he doesn’t realize he’s telling her. His dad dead eight months, his brother four, and traumatized Mother rarely leaving her room, who’s to teach him how to be a father and a man? That cellar is suggestive in other ways as the secret meeting place of the boys, redolent of illicit, forbidden-fruit assignation. 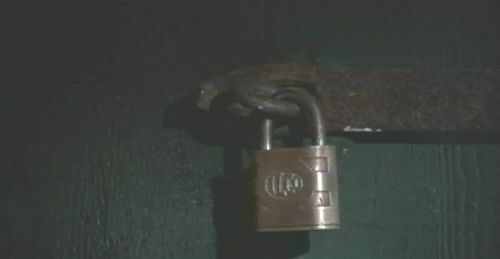 Uncle George padlocks it, like a chastity belt, to little avail; what’s driving them can’t be stopped. Here the boys discuss the heirloom ring Holland has passed on to Niles and the mysterious Thing wrapped in blue paper associated with it: the finger Niles had to shear from his brother’s corpse to obtain the ring, the phallus and the yoni never to be properly united as intended. Niles houses these fetishes in a Prince Albert tobacco tin he carries everywhere, an albatross-like legacy from the father (whom Tryon compares to the Prince), a portable coffin, for the death that attends him through life. For the child possibly unclear about his gender role its contents signify the twin aspects of masculinity and femininity waiting to be resolved in some cubby of the unconscious. Alexandra’s discovery of the Thing results in her plunge down a flight of stairs, like Father before her, rendering her catatonic. The fair’s celebratory timing lends the story a broader historical context. Taking place in the midst of the Depression, neither novel nor film acknowledges the hard times afflicting the “Other” America outside its idyllic Hartford, Connecticut (Tryon’s hometown and that of Niles’s possible namesake, silent actor Niles Welch; Holland may be a tribute to Steve Holland, cover model for the ’50s reprints of the Doc Savage pulps prominently placed in the movie). Mulligan’s atmosphere of forced jauntiness, riding a wave of nostalgia from Bonnie and Clyde through The Last Picture Show, Paper Moon, Sounder, Sha Na Na, and beyond, deepens the sense of disconnection; hardship and deprivation had to have been on the characters’ minds, no matter their gaiety. That displaced anxiety had to go somewhere, and, as with the family’s travails, it fell on Alexandra, the portrait in the Perry attic. Reclusive at first, she withdraws deeper still on realizing the extent of her prized child’s capacity for wrong. Tryon’s primary subtext then is grief. Grief sidelined, grief undefined; winged grief, guilty grief, blinding grief, abject grief, inexorable grief, grief as a motivating force. As a New England gothic, the story calls to mind Hawthorne and Poe and the irresolvable contradictions of a nation in its adolescence, charging toward the opposite shore like a teenager toward adulthood without ruminating on the knotted skein of inheritances that brought it there. By story’s end everyone in the Perry family will have fallen, from the father’s biblical tumble down the apple cellar steps to Holland’s down the well, from Alexandra’s plunge down a different stairway to Ada’s descent into hell trying to put an end to the horror she holds herself responsible for for having passed on her game. Don’t you think that’s unfair to the old woman? While it’s clear that the feminine heritage in Niles’s family is imagination (Ada, again, is Alexandra’s mother; the gift, apparently, skips a generation), it’s not clear what’s so bad about that or what, exactly, its masculine counterpart is. The story’s symbol of malign legacy is the Perry family ring – the father’s line – emblematic of the cyclical nature of their troubles, which Ada associates with a curse. (Tryon connects it to the Nibelungenlied – the Ring Cycle – which coincidentally features a character named Hagen.) Never adequately defined in novel or film, it’s assumed this malediction to be madness (Grandma Perry had legendarily been carted off to the asylum earlier), a disagreement between outer reality and inner truth. “Peregrine, for Perry” is Niles’s catchphrase for its insignia: peregrine, for the wanderer, the pilgrim – the stateless, outcast, Other. Both novel and film’s Big Reveal takes place by the grave Ada brings Niles to to force his confrontation with the fact of Holland’s death. Here she has him do the Game on the figure in the grave, or the buried aspect he needs to acknowledge in himself. As he describes its cold, dark surroundings, “like the apple cellar,” he gradually comes to recognize the black box he’s in, the closet where he’s kept his secret personality. As with Uncle George’s attempt to prohibit access to the cellar, Ada’s effort at getting Holland to stay in his box is doomed to failure, and for the same reason: he is inherent, part of Niles’s nature. (His whistling is the first sound you hear on the soundtrack as Niles is discovered in the woods invoking the spirit of the forest; this and his signature harmonica are both instances of breath-music: spiritual.) When Niles alludes to death with the observation “They put you in the ground,” it’s a comment on the circumscription that plagues him throughout the film: forbidden from expressing his libido, all that’s left him is Thanatos. Like all body-count thrillers, the modus operandi of The Other is the elimination of inauthentic elements of the self in order to reach the core personality within. It’s a serial form of vanishing act, like the one the boys observe at the fair after their confrontation with the boy in a jar. Thus the death of the archetypal (never-seen; only spoken-of) apple-bearing father, aka Original Sin; bespectacled cousin Russell always threatening Niles with exposure, Shame; uptight, out-of-touch Old Lady Rowe Prudishness and Propriety, leaving only transgressive Holland to overtake the personality. For closeted Tryon, this identification with The Unthinkable was an act of defiance, a way of burying that shame over what was to him perfectly natural. 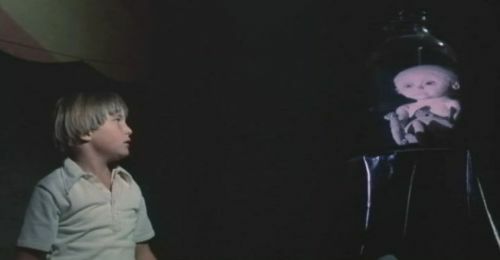 The most poignant line in the film comes when Ada holds vigil with Niles after the scene in the graveyard, discussing what had just happened. 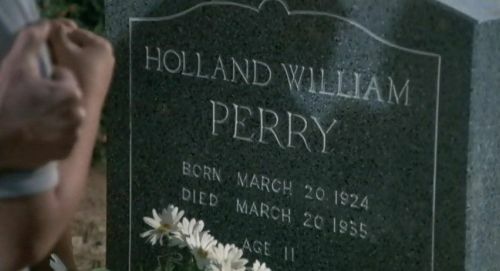 What she intends is to birth him back to the real world abandoned on Holland’s death, but it’s clear the revelation hasn’t taken. “The time came for games to stop,” she explains, and for him to begin to see the world rightly, and it’s easy to read the scene as Tryon’s Wise Woman counseling him on his decision to leave acting to pursue his own truths. (Their conversation has the tenor of a disapproving father lecturing his son over an unfavorable career choice – acting, say – or a boyhood sexual inclination he needs to abandon.) His reply is devastating. “Have I seen the real world yet?” at once indicates his failure to accept what she’s laid out as well as offering a repudiation of that world, a one-sided place of denial rather than a forgiving and holistic unity of impulse and action, nature and domesticity, death and life, evil and goodwill – self and other. To any parent aware of the liabilities visited on their children, never to know the extent of the damage we’ve wrought, it’s a reminder that we’re bound with them in that jar-world and couldn’t say better, ourselves. Tryon saves his final affront for the birth of Niles’s niece, an act his brother can’t identify with by any leap of imagination. (When Niles announces her arrival to Alexandra, the horror on her face betrays not only her realization of what he plans to do, but its symbolic function as the “outing” of his feminine self.) “Holland” devises his most heinous feat of legerdemain in response: switching the infant in the cradle with a distorted figurine lamp (after the changeling fairy tale Niles calls Holland’s favorite), before drowning it in a wine cask. 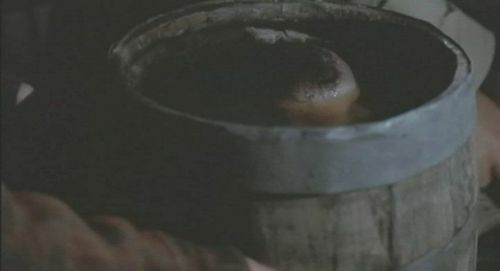 The revelation of the babe crowning out of the keg provides the film its final frisson, meaning, the image the entire process has been leading to – a demonstration to those gathered of how it feels to be the drowned, the buried, the hydrocephalic, the hideous secret – the aborted, unspeakable, forbidden Other. After the barn has been razed in the wake of this incident, Mulligan’s camera pans back to the house and the eyes gazing from within. In fact, there are two sets of eyes. One has had the world explained but hadn’t the wiles to make use of this knowledge; learned the secret of empathy but not the ability to direct it to the proper object; been given wings but winds up shuttered inside the family façade. I am the other. How unfair again of Tryon – to name me after the Russian Czarina, guilt-ridden carrier of the disease passed on to her doted son Alexei, when Ada more correctly affixes the malady to the father’s line. As mother of these boys, if not author of their acts, I hold myself culpable all the same for what they’ve done. Having watched them grow and develop from infancy – and given beat to their hearts before that – I am the objectivity they lacked, the insight they hadn’t the maturity to have acquired, the judgment that should have been meted but for love and the hope things would work out. I am the unifying principle that would have brought together their natures and made them make sense, to themselves as well as a nation facing its own Depression. Tryon performed the ultimate disappearing act by abandoning acting for writing, but look what he’s done in the doing: created me to carry his burden as I have had to carry my family’s. What have I done to deserve this? Only loved my children; only seen one more chance at redemption with every calamity. That’s why I call to you, my son in the other window, now. Look to the apple cellar, where your father tumbled on his death and where you stored your guilt for wrongs and injustices that may never be righted: the burrow, the furrow, the depression no escape act can release us from. American as pie. For a while you got away – we all did – with pretending your actions were somebody else’s, or, worse, that because your heart was pure your deeds were justified. Your mistake was in confusing innocence with naïveté. You can’t hold onto the one forever, and clinging to the other will only bring trouble. You see that now they’re tearing the barn down. It’s over. Still, I know you and I know your capabilities. You were written brilliant. You were given skills like no one else, and you were honed to make use of them. As many personalities as you contain, you’re gifted enough to command; as many limitations as were imposed on you, you’ve found a way to transcend. (The original meaning of the term changeling is one given to change.) You were conceived in an act of reinvention after all, an escape from the impossible. So don’t focus on what your author has done to contain you; he couldn’t help it, himself. Focus on the ways he birthed you too, from the drainpipe he has you emerge from in the beginning to the vaginal slit in the circus tent and the apple-cellar womb he bears you out of in the end. At the same fair you found the Hydrocephalic Boy you also witnessed the magic act you figured out by playing The Game on the charlatan performing it, the trick that helped you escape the fiery end meant for you as well. (Your author gave you an Out.) Your final getaway may be in escaping this family and recreating yourself as conjuror of your own fate, yet. As troubling as Mulligan’s ending may be, there’s another aspect to it. For all its hopelessness, the film offers no indication that your imaginative playbook is played out. As with the Starchild Arthur C. Clarke wrote in his novelization of 2001, anything can happen. It is time for the changeling to realize himself. It is time to give up the act. Steve Johnson lives, works, and writes in Cleveland, where he formerly published the incomparable zine Delirious.